Karst Worlds: Underground GPS: finally possible! GPS is everywhere, in your car, handheld, mobile, ... everywhere except underground. As GPS signals cannot penetrate into the ground it cannot be used in caves or mines. A Swiss company however found a smart solution to this problem and presents now the first Underground GPS. 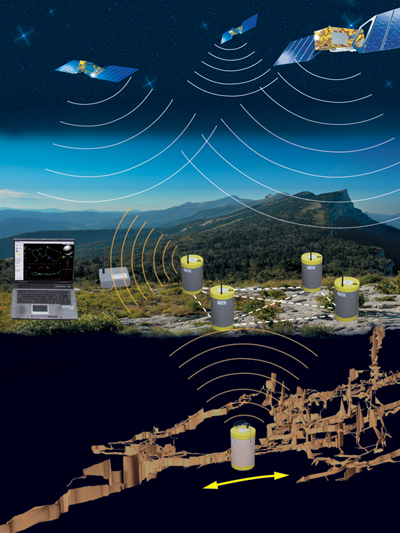 Since 2004 researchers from the Swiss Institute of Speleology and Karstology (ISSKA) were working on a system for underground positioning (see paper about U-GPS v1). In 2010 the company InfraSurvey was founded to commercialise the idea. A new prototype was developed (U-GPS v2) and tested in real world situations. It's now even possible to follow a caver in real time (see movie on the main page of Infrasurvey). The receivers are placed on the surface, roughly on top of the underground passage to be measured. 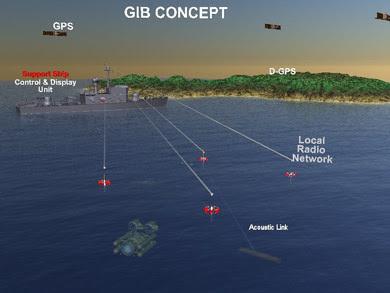 They are automatically self-located using GPS. 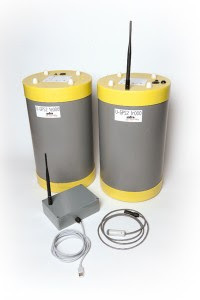 The underground transmitter sends a signal that is detected by the receivers located at the surface. The computer then calculates the exact position and visualises it, making it possible to follow the moving object in real time covering a surface of 300 m x 300 m without the need to move the surface receivers. A smaller, lighter version is being developed (less then 2.5") as well as a waterproof version (ipx 8, up to 100 m) and will become available in 2011. More information can be found on the website of InfraSurvey or on the website of ISSKA: here and here.